ROMAG can custom manufacture any size and shape magnetic pieces in a variety of magnetic materials and grades. These are solid Neodymium/Rare Earth magnetic material, formed into standard and custom shapes. They do not use a sophisticated circuit as in our other products. 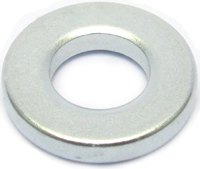 Normally these magnets are supplied in zinc or nickel finish to prevent the rapid erosion inherent in rare earth magnetic materials. For severe environments or water exposure, we can supply epoxy coated. Custom sizes can be made in any shape, geometry or strength.